As tattoo is a reflection of a personality, so, it can be always be used and indeed are used to depict the minds and personality of the person tattooed. People have their own reasons to get their bodies inked by some tattoos and if you are also looking for something extraordinary, then you are at the right place. 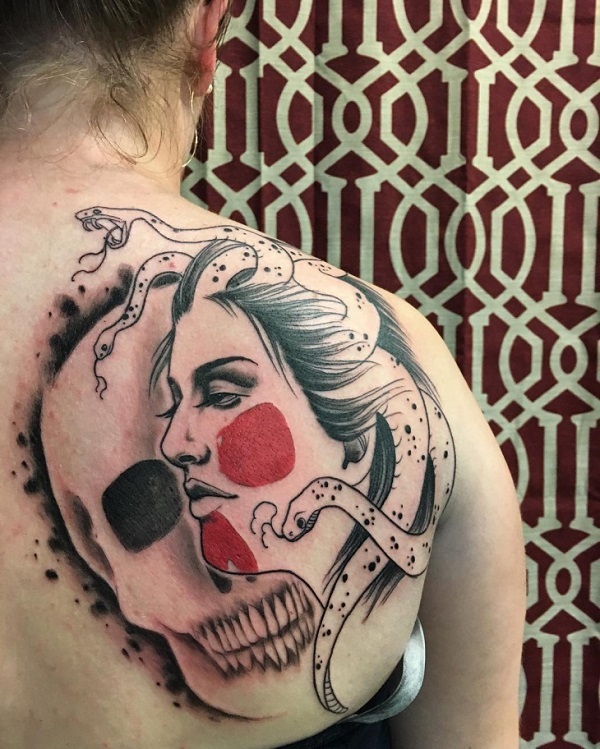 There are different kinds of tattoos that can be inked by the professionals on the bodies of people ranging from modern to contemporary and from ancient to primitive. You can see a wide range of tattoo collection in this category on our website. And the one category that I am going to introduce here is well-known in the ancient history. 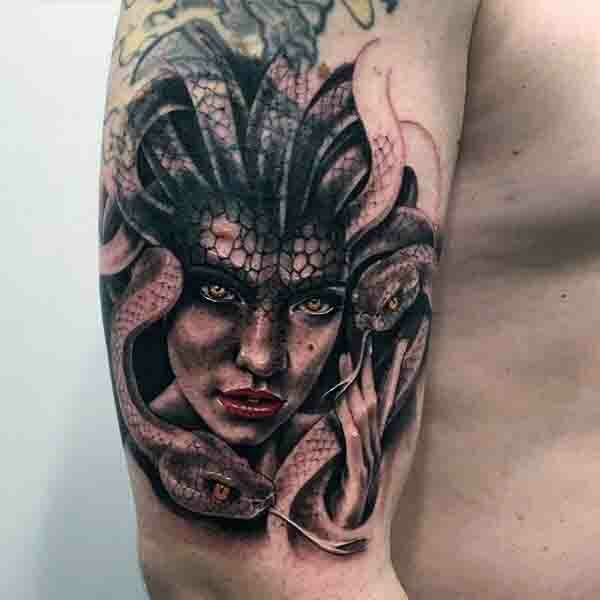 I am talking about Medusa, the character from Greek mythology.If you are looking to get a meaningful tattoo with the roots in ancient mythology, then Medusa is the best one for you. You might have heard of Medusa, and if not, don’t panic, that’s why I am here. Medusa, a famous Greek character, one of three daughters of Ceto and Phorcys, was known as the most horrific personality with the monstrous face and venomous snakes surrounded all around her head instead of hair. She was born as Gorgon. There are number of stories being associated with her and that is the reason why now, she has been used as a famous form of tattoo. It is suggested through Greek literature that anyone who stare directly at the face of medusa was turned completely into a piece of stone and that is why Medusa is associated with the snakes and stones. The tattoo of Medusa depicts a number of meanings and considered as a powerful emblem and an inspiration for a variety of art. She is not only used in tattoos, but also in a plethora of games, movies and videos as well. Medusa is said to have wings and she would fly like a bird, so considered as symbol of freedom. Moreover, some of the Greeks thought her to be goddess, so she is also depicted to be a symbol of feminine power and strong character. The Medusa tattoos comes in the number of sizes and colors as well. But it is most commonly tattooed in black and gray colors to retain its evilness and charming look. If you are thinking to get a Medusa tattoo for yourself, you have to make a right choice. The medusa tattoos look incredibly great if done professionally and correctly. All you need is to choose the right placement and the right tattoo artist. 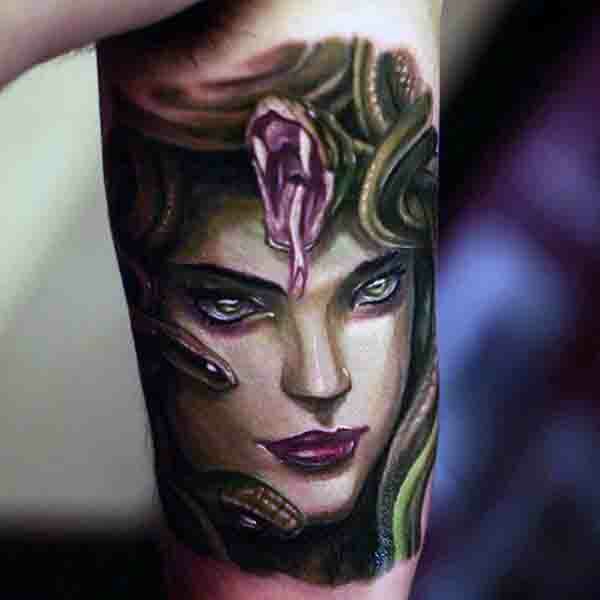 Here are some amazing Medusa Tattoos that you cannot resist. Check them out and make your decision. 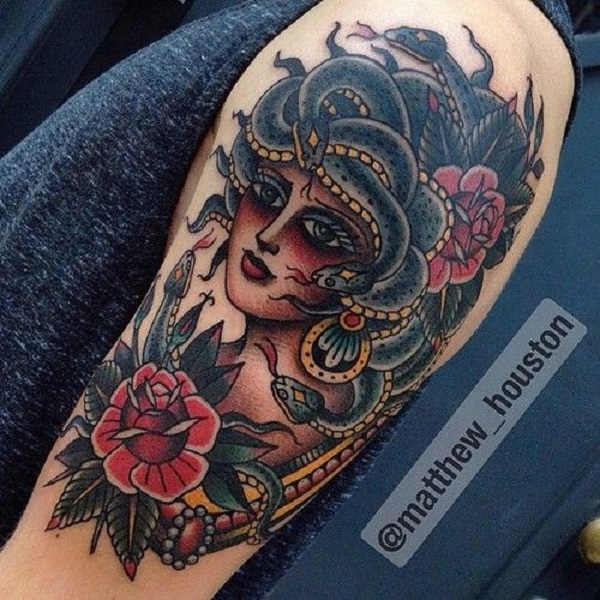 Goddess Medusa Tattoo. 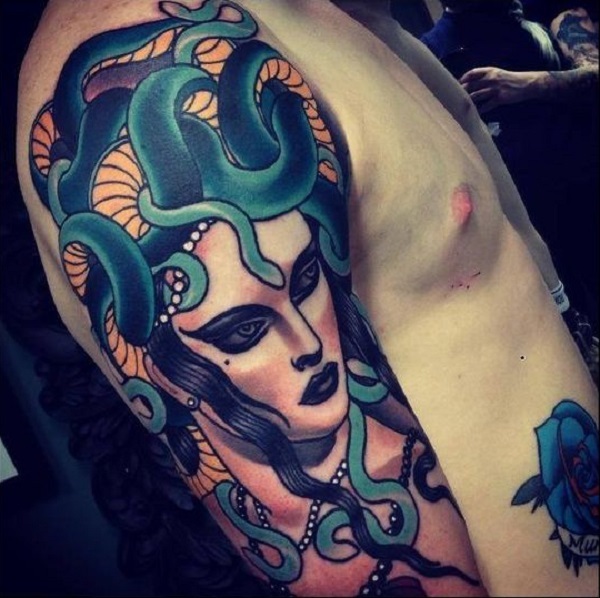 As said, Medusa was considered to be a goddess, so, this tattoo is somewhat representing her goddess image. Side Posed Medusa Tattoo. This black and white Medusa tattoo is the one eye-catching thing you can have on your body. Her side pose with empty no eye ball looks amazing. Realistic Medusa Tattoo for Him. This tattoo is looking so realistic that you can now understand what I meant to say above. Artist did an amazing job and offers incredible details on each ad every feature of the girl. Evil Medusa Tattoo For Inner Arm. There was something wrong with the eyes of Medusa as well. Some stories suggest that her eyes were given special power that can turn onlooker into a stone. So this evil tattoo with white eyed Medusa is worth trying. 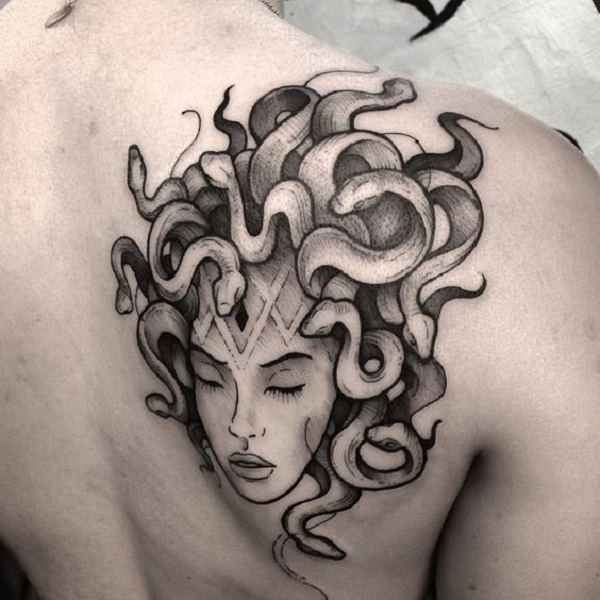 Coiled Snake-y Hair Medusa Tattoo.The snakes surrounded over the head of Medusa were mostly coiled, giving her a curly haired image. This tattoo on the back makes the best placement ever. Terrifying Medusa Tattoo. 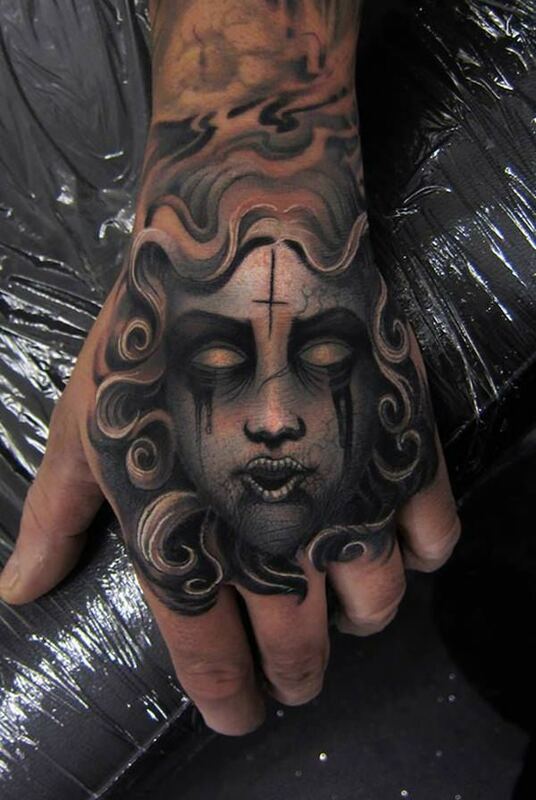 This wholly black shaded Medusa tattoo is extremely terrifying piece that can give the lookers goosebumps. Fiery Medusa Tattoo. Although this piece is extremely frightening and fiery, but it’s done so well. The anger in the eyes of Medusa can be seen well. Snake Head Girl – Medusa. Its so much interesting that how many portraits can be done with a single girl. 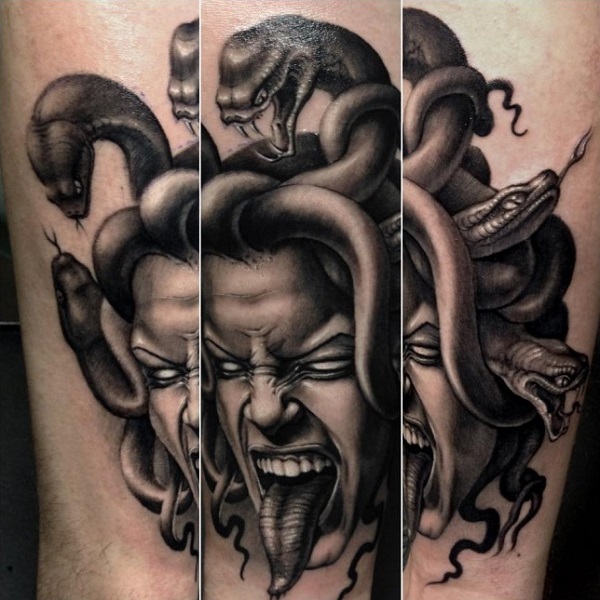 This 3D Medusa tattoo is worth the shot. 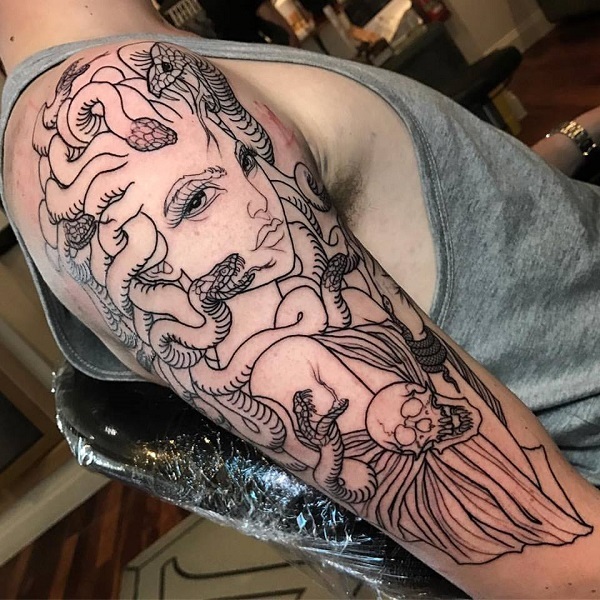 Sided Medusa Tattoo on Upper Arm. 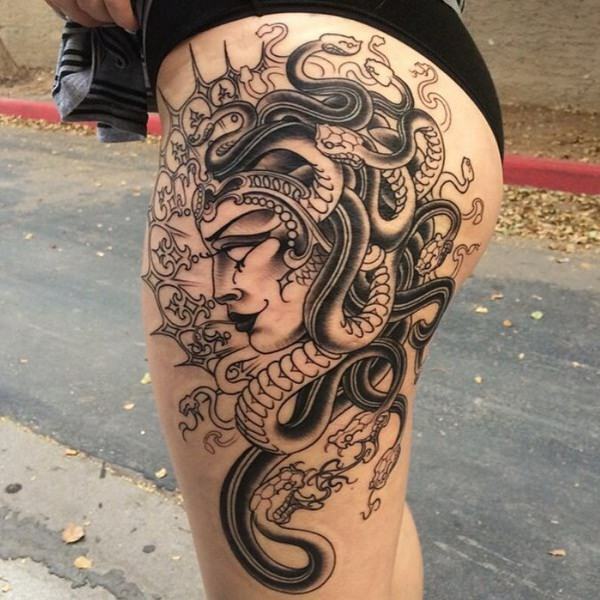 Here is another amazing Medusa tattoo giving a gaze to her side pose. The snakes over her head looks real and gives a evil sign. 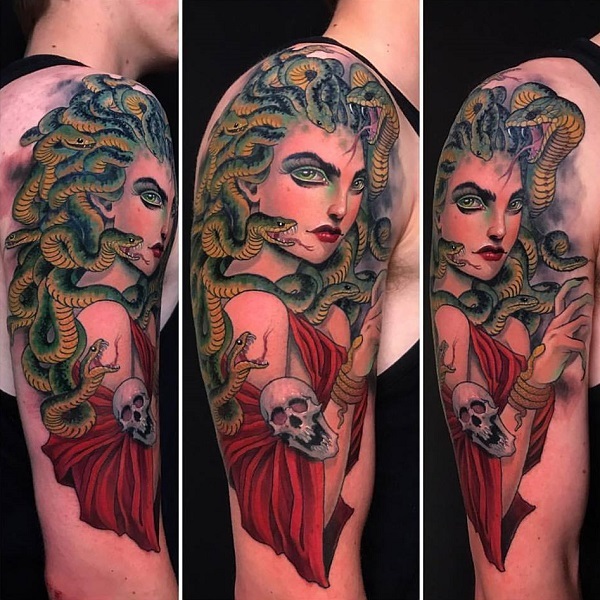 Beauty Goddess Medusa Tattoo. As depicted in Greek mythology, Medusa was really a beautiful women, who was turned into an evil one on Athena’s jealous reaction. 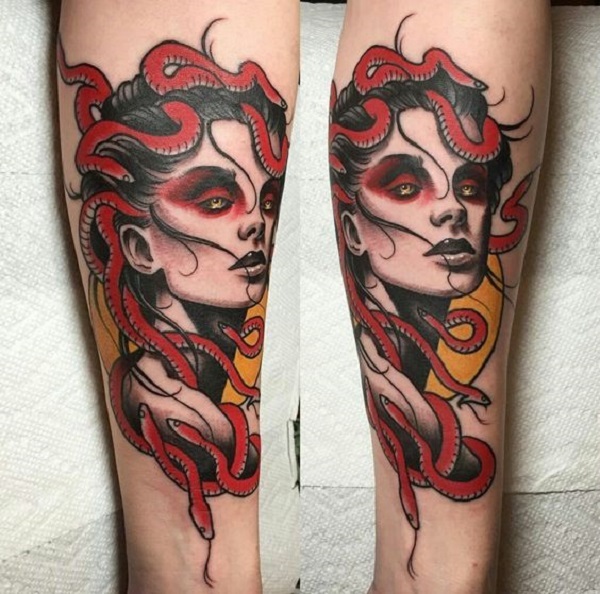 Red and Black Inked Medusa Tattoo. The use of colors in this tattoo is amazing. Red and black – the sign of pure evilness reflected well with these two colors. 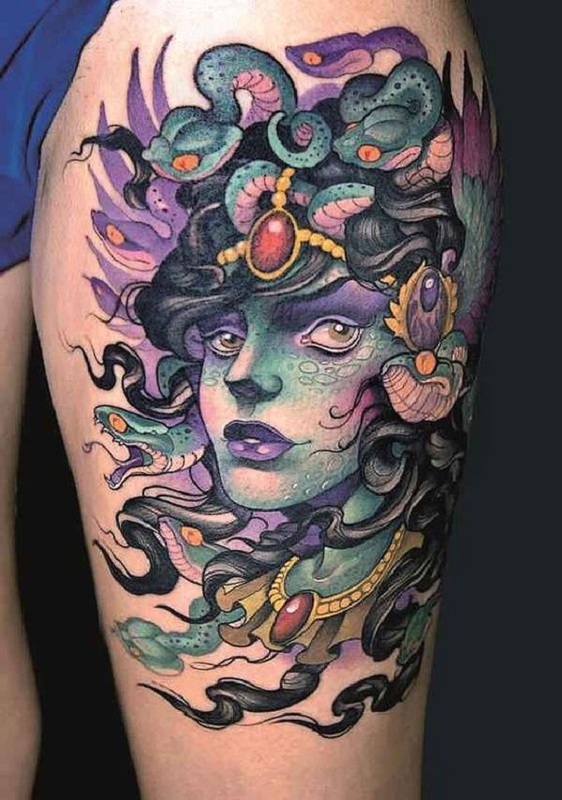 Colorfully Inked Medusa tattoo. The details and the coloring of this tattoo is very eye-catching. The snakes and the Flower here in this tattoo makes a deadly combo. 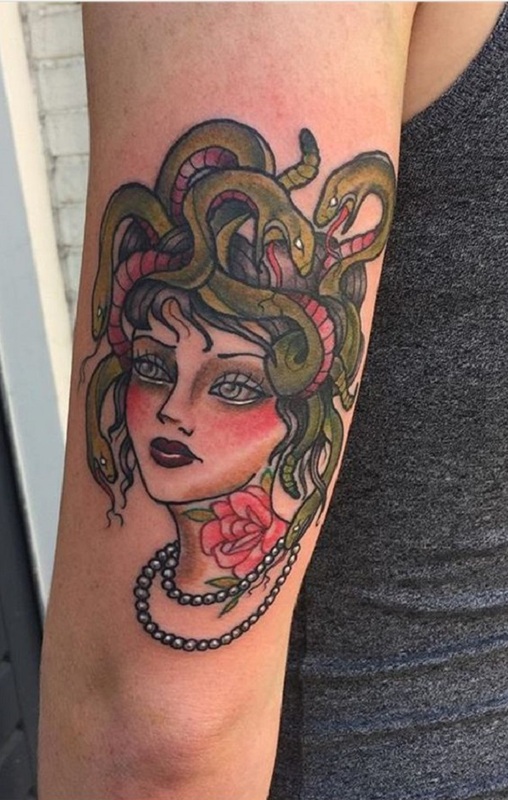 Evil Headed Medusa tattoo. 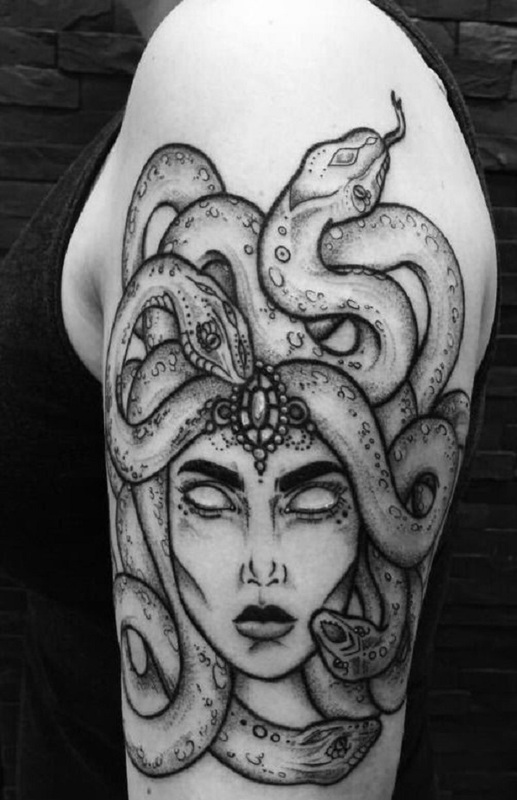 As Medusa was known to hateful and controlling, so this tattoo on the inner arm represents this image of Medusa very well. This is definitely what Greeks think of Medusa. Medusa Killing with Eyes. As eyes were the mysterious part of the Medusa, so, this tattoo captures the same thing. The rays coming out from the eyes of hers highlight the mystery. 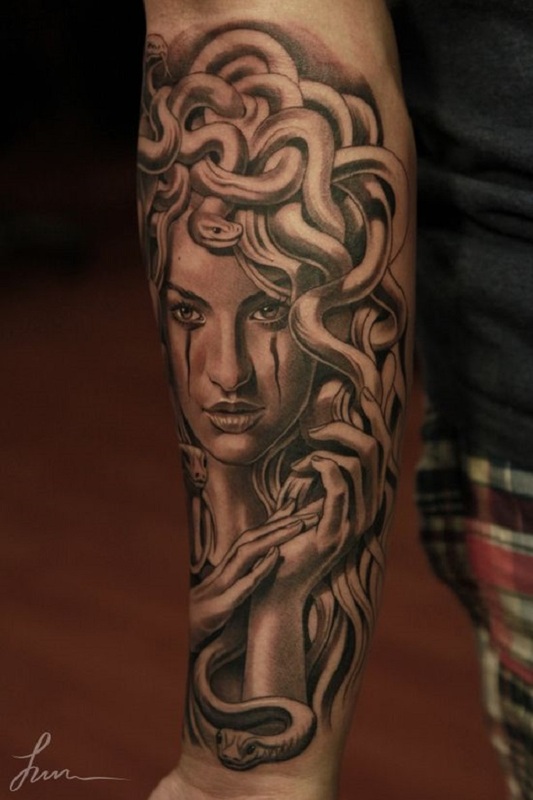 Gorgeous Medusa Tattoo for Arm. Every woman is beautiful in her own way, says by someone. So this saying is turned into reality by the artist in the tattoo. Beautifully Studded Medusa Tattoo. 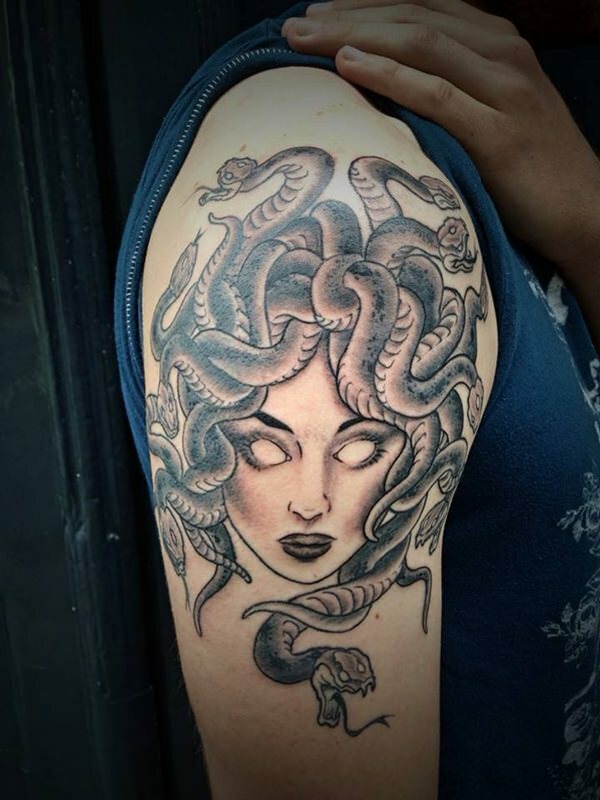 Medusa is depicted to be an evil figure, but this tattoo is contrary to her image. This tattoo is amazingly inked and with minor details, the jewels studded in her hair and neck enhances her beauty. Black Inked Medusa tattoo. Evil is usually depicted with black color, so does this tattoo. She looks asleep yet fierce. Blue Inked Medusa Tattoo. The Blue colored snakes over the head of Medusa looks terrible. The ornaments with the same color also adds to her beauty. Medusa Tattoo with Skull. This is another amazing portrait of Medusa that is done amazingly by the artist. The artist did a tremendous job capturing the eyes of the lookers. 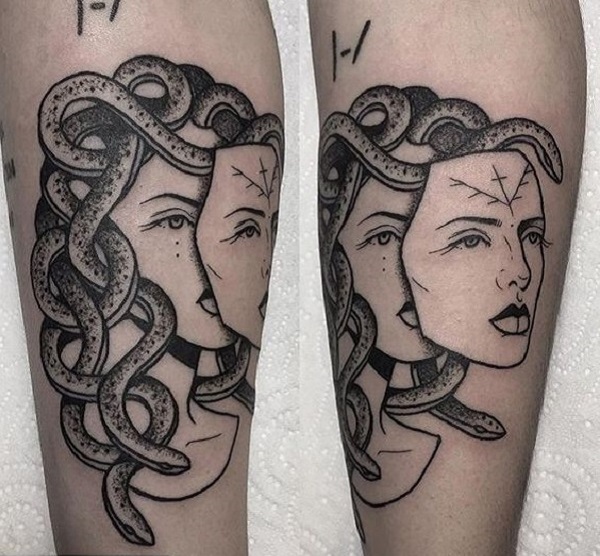 Dual- Faced Medusa tattoo. The beauty and the evil are the two sides of Medusa. That is what depicted in the tattoo. 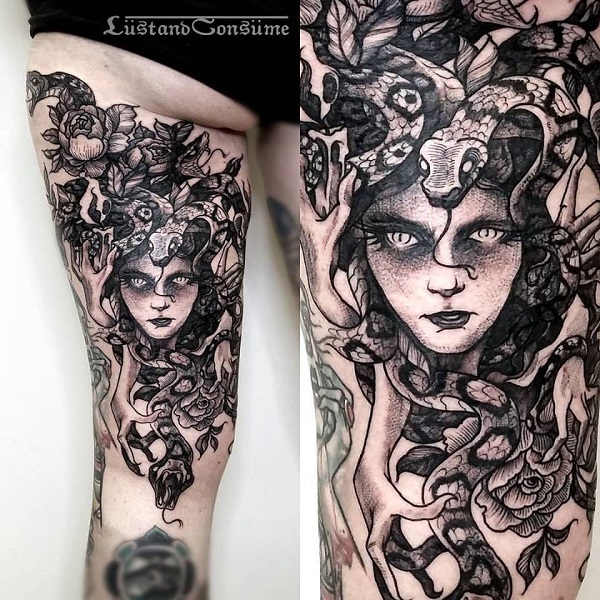 Beautifully Done Girlish Medusa Tattoo. 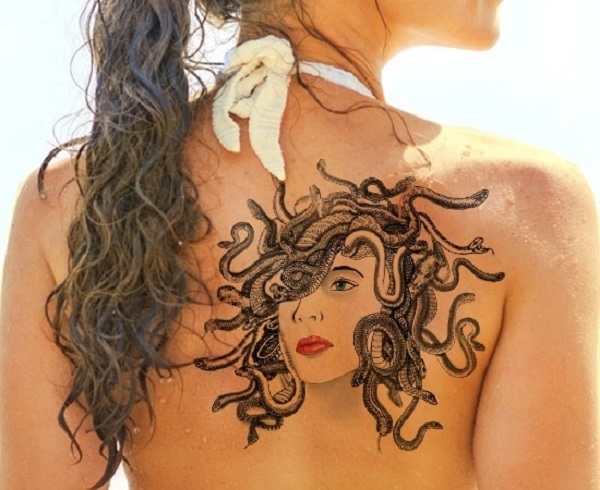 This image of Medusa is sensual covering the back of a girl. This placement of the tattoo is really effective and is really amazing. 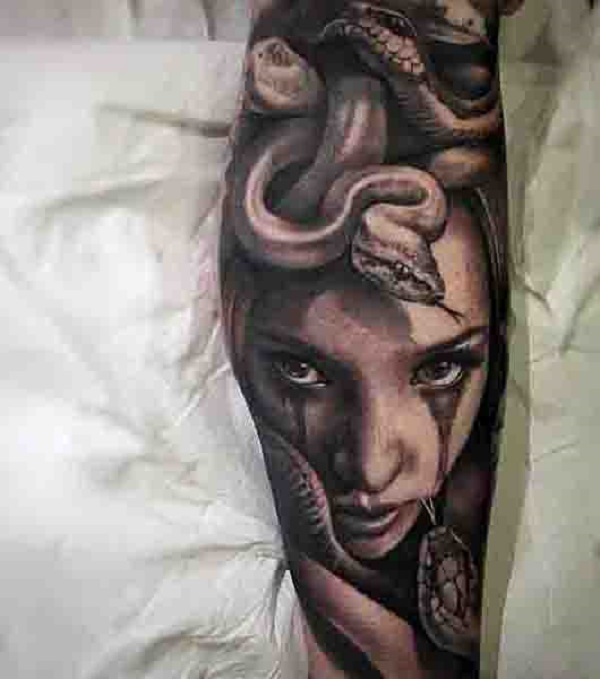 Tribal Medusa tattoo.The snakes appear in this tattoo so real tat it seems they would start moving right away. The coloring and details of this tattoo is actually adding life to this tattoo. Greek Goddess tattoo. This seems like an Egyptian mummy, but in reality, this is an amazing portrait of Medusa. Her hair and eyes are shining like there’s some hidden secret stored in them. Scaly Skinned Medusa tattoo. This is something terrible and horrifying at the same time. The snake like scaly appearance of the skin of hers turned out that she is going to sting any person any moment. Medusa with secrets. Although there are number of stories revolving around for Medusa, but in reality, Medusa still remains a mystery to all. This picture depicts the hidden secrets behind her personality. Colorful Medusa tattoo for Arm. This beautiful yet frightening piece of art is really watchful. This tattoo evokes number of different emotions when people see it. Gorgeous Grey Inked Medusa Tattoo. 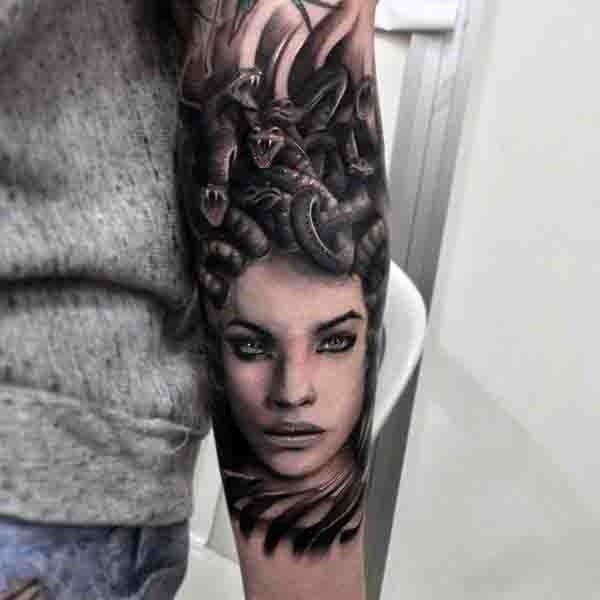 This amazing tattoo is actually what Medusa seemed to be before the curse. The ornaments and the mole above her lips adds sensual touch to this tattoo. Medusa With Flower. Femininity is well described in this tattoo. If you are looking for a tattoo with ancient roots depicting feminine power, this one is best option that you can try. Frowned Medusa Tattoo. This picture depicts the sad and broken image if Medusa. No one knows what’s in her heart but, every one knows about her evil image that she carries well with a broken heart. Winged Medusa tattoo. As suggested in some case, Medusa got wings that give her power to fly. This means Freedom! If you are a rebel of freedom, you ought to get this tattoo. Witch-y Medusa tattoo. 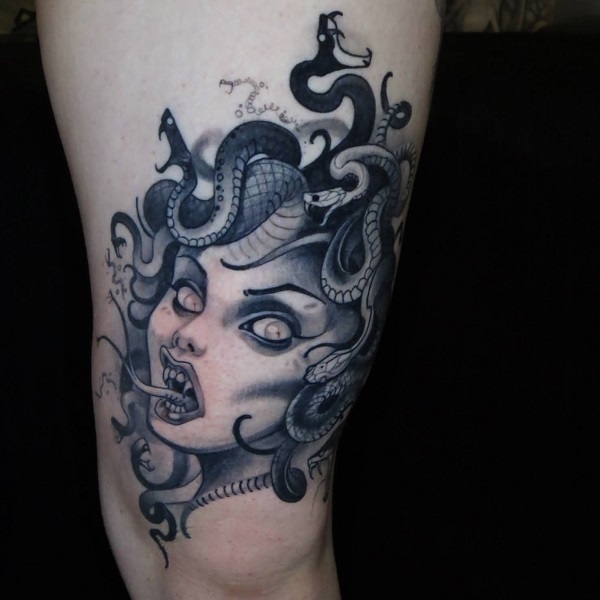 The evil image of Medusa is well depicted in this tattoo. Typical to nature, she will always be remembered as a villain. Calm Medusa Tattoo. This tattoo is brilliantly done. There seems an overall peace and calmness that is officially contrary to her image. Evilness at its Peak. The color contrasts in this image are amazing and the story here looks so much intense. 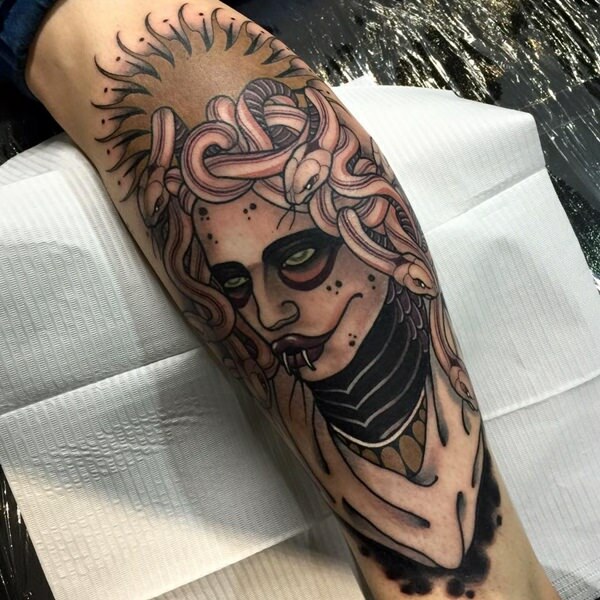 Overall, evilness – the trait of Medusa is at its peak in this tattoo depiction. . Screaming Medusa. it looks like that Medusa is screaming here with anger and fierce in her eyes. The depth and details n this tattoo are perfect, making it a worth trying piece. Outlined Version of Medusa Tattoo. Often tattoos are inked only with the outline, with no color filling. This version of tattoos done great and looks amazing when created by a professional. 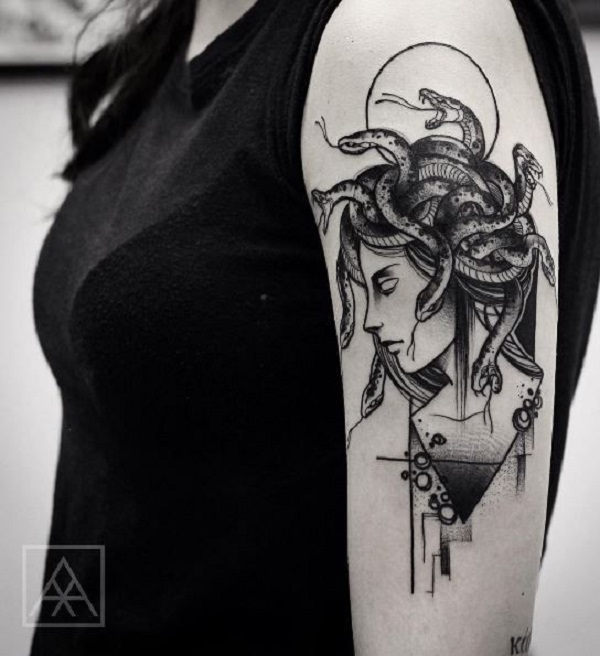 Sensual Medusa Tattoo. Another amazing sensual tattoo of Medusa showing her beauty and femininity. The coils in her hair looks striking and that would surely capture the interest of onlookers. The Blue Inked Goddess. With the wings, the snakes and ornaments, this goddess seemed to be at peace. This is one of my favorites in the entire collection. Striking Medusa. 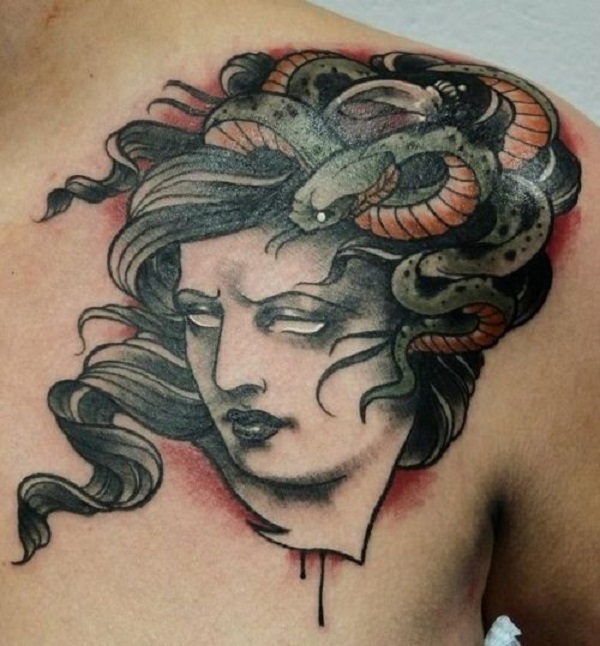 This beautiful portrait of Medusa is actually very striking to get inked on your body. You can have this tattoo anywhere on your body to depict your emotions. 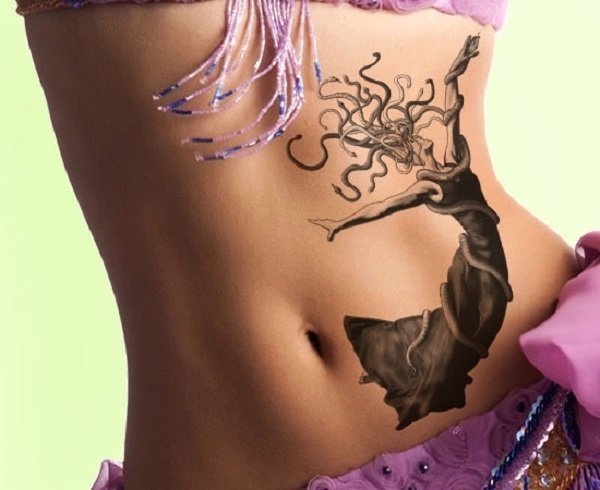 Dancing Medusa Tattoo. Dance is an emotion, so Medusa is. When both these emotions get combined, they make a great tattoo. 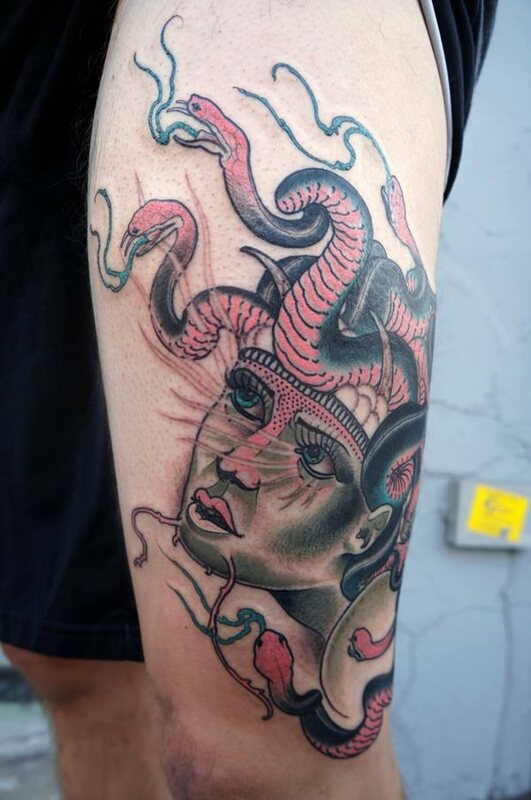 Squawking Medusa Tattoo. When the goddess becomes angry, she is destructive to an extent that you cannot even imagine. This is what completely seen in the tattoo inked above. Skull with Medusa Tattoo. 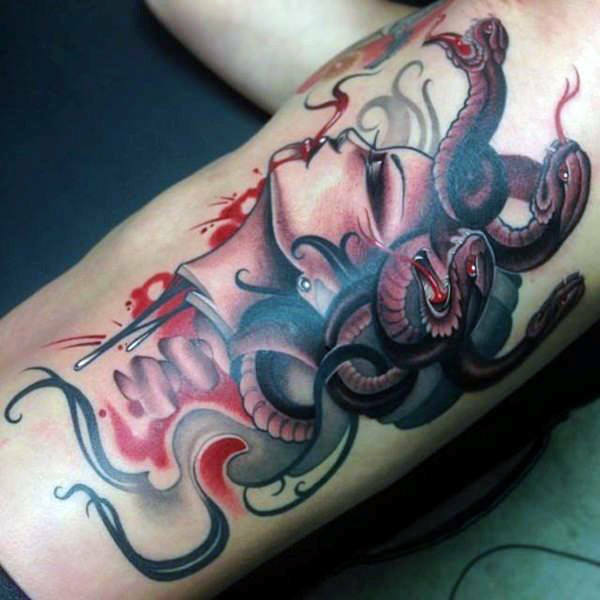 Skull and Medusa in a single tattoo – Evilness and danger at their peak.. Starring Medusa Tattoo. Her voluminous hair and her deadly eyes are depicting the mystery hidden behind her skin. Lovely Medusa tattoo for Arm. The snakes seemed to be active while the lady having them seemed to be sensual and sleepy simultaneously. 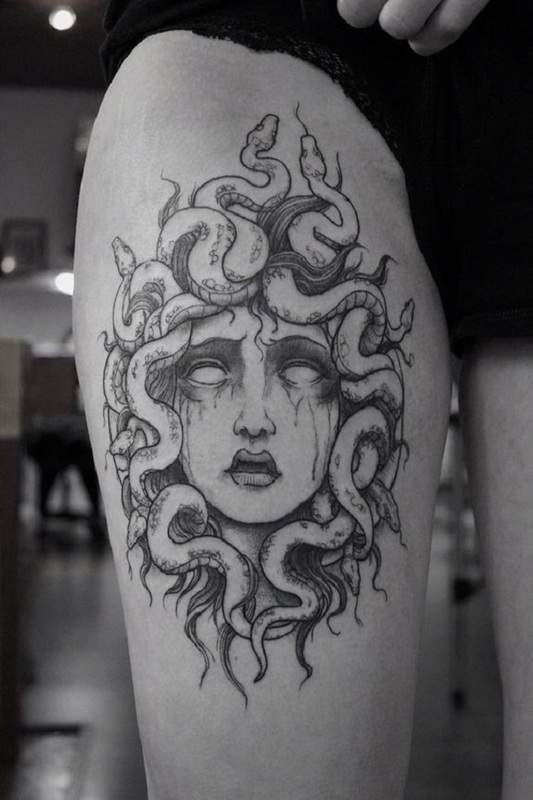 Thinking Medusa Tattoo. Her thoughts are so intense that no one can even imagine. That makes her so much mysterious. 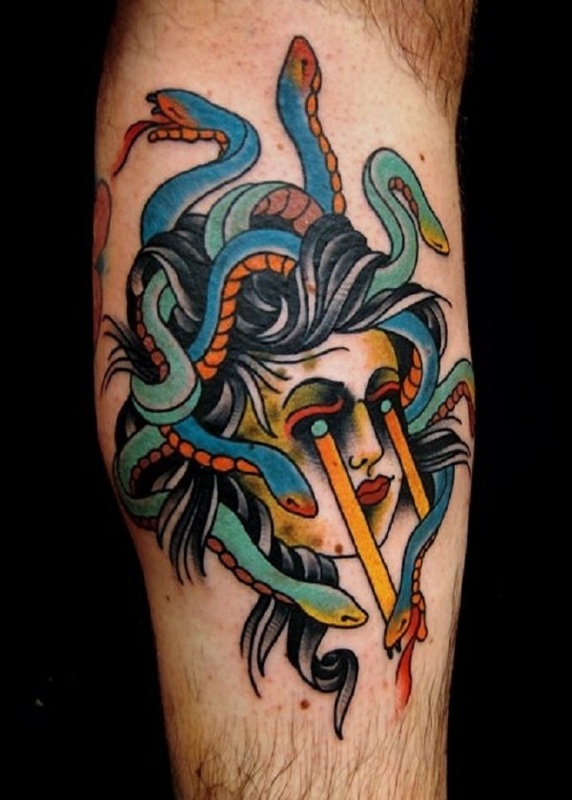 Indignant Medusa Tattoo. the anger in her personality is well shown in this tattoo. 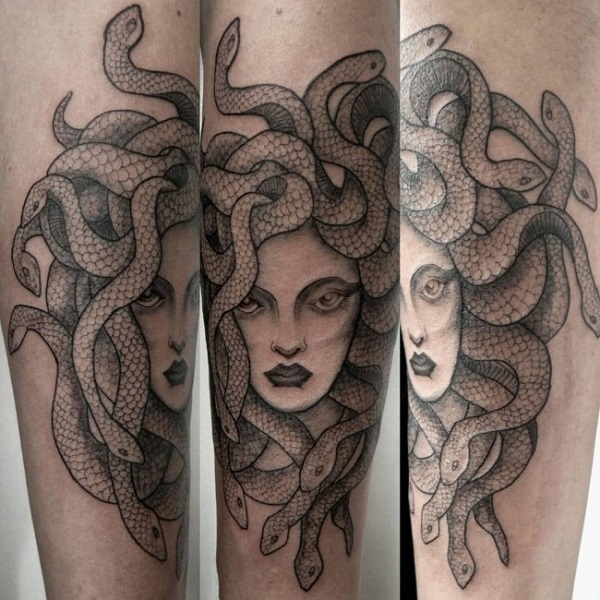 If you want to fend yourself from haters, this tattoo of Medusa is more than enough. Medusa With Blood Tattoo. This is another intense piece that you can handle with your personality. The color combinations and the artistic skills adds life to this tattoo. Medusa with Coiled Snakes. This tattoo is showing her innocent side. But the snakes in her hair looks so angry taht they can bite your haters anytime. Medusa with Snake Tooth. With snakes in her hair and venomous tooth in her mouth, Medusa is always ready to sting her enemies. 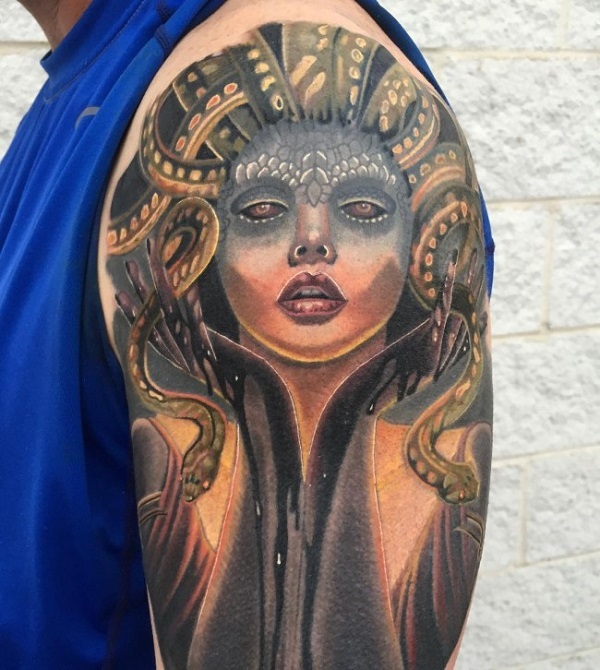 Greek Medusa on Sleeve. 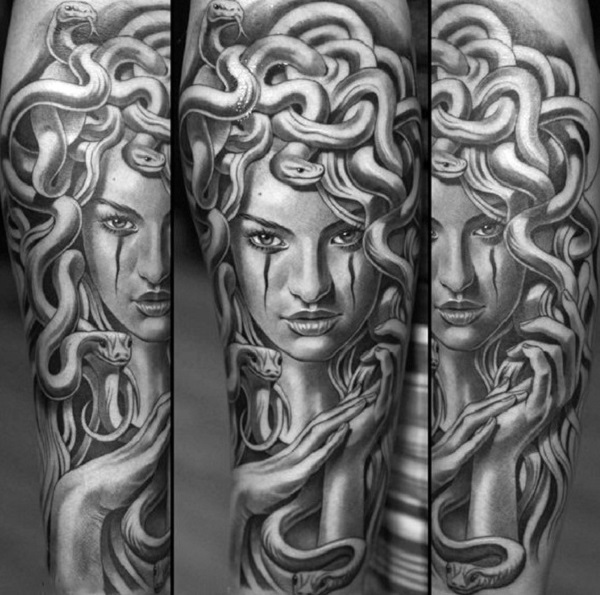 If you are looking for some tattoo to cover your sleeves, then this Medusa tatoo is the best thing that you can have. Beautiful Medusa Girl. Embellish your arm with this beauty and mystery, both. Show the power of femininity and strength that you have got within you. Stunning Medusa tattoo. Another great portrait of Medusa is next on the list. Get this tattoo inked on your body and you would be admired by all. Cursed Man and Medusa. As mentioned earlier, Medusa can curse the people who look directly at her face. This is the same thing depicted in the picture. A man is turning into stone as if he tried to look at her. Eye- catching Medusa Tattoo. This one is my favorite because of its details and amazing depiction. 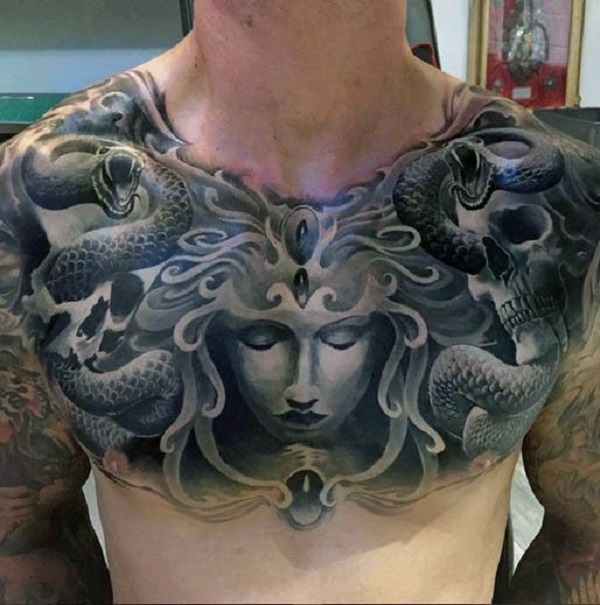 Medusa Chest tattoo. 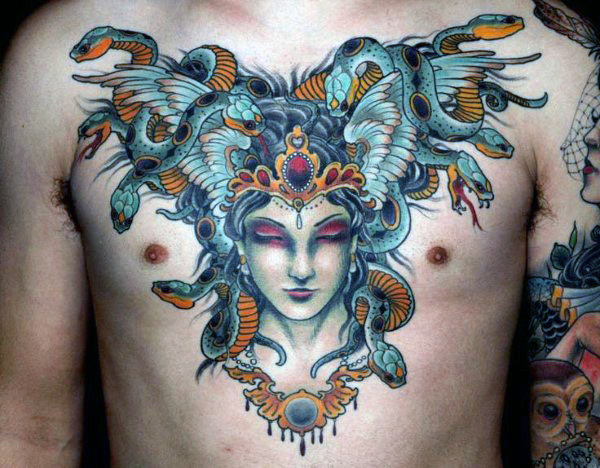 Get your chest covered with the evil power if you are so evil like Medusa. Trust me, people will fear you! Amazing Brown and Black Inked Medusa Tattoo. This glowing image of Medusa is so sensual taht no man can resist her beauty and charm. Shady Medusa Tattoo. With her eyes closed, she can cause so much destruction. Imagine what would happen if she open her eyes?! Black and White Medusa Tattoo. The black and white tattoos are always in fashion. That’s why I have added the Medusa Black and White too in the collection. If you are a fan of 1800’s art, this one is made for you. Medusa with Deer Antlers. Irritated as hell, Medusa with deer antlers and snakes over her head have something running deep inside her mind that is badly annoying her. This tattoo shows her emotions. Greek Medusa Portrait. This is not a typical Medusa piece. It is very light and simple, but surely gives a number of meanings. If you have decided to go with the Medusa art, you have made the right decision. Just choose your right tattoo from the above collection and you are pretty good to go.